It's is a cracking way to bring back your Google navigation bar and feed your perfectionist self. Here we are going to edit the Google own URL “www.google.com” Easy there, it's not any rocket science, just a simple step. → For e.g. - if your link is "https://www.google.co.in/?instant&ion=1&espv=2&ie=UTF-8." Then change it into ‘"https://www.google.co.in/?instant&ion=1&espv=2&ie=UTF-8&‘?noj=1." 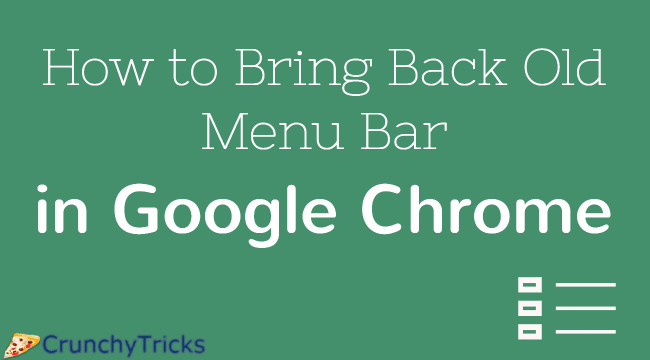 Now that you have brought back your black menu like a pro. You would be thinking, “What a tedious step, repetitively typing the same thing” I know it's very annoying, but you can probably fix it. Just save the Google page as a bookmark or make it your homepage, the choice is yours. Click on ‘+ Add to Chrome' and thus, adding as an extension.